As we come to the close of the Vintage Era, another mod Barbie was released; #1144 Growin' Pretty Hair Barbie with bendable legs. She doesn't have bangs, but she does have an updo hairstyle with blonde hair that grows by pulling gently on her retractable ponytail. She came with two extra hair pieces. There were only two versions of this girl, and both had the same markings; ©1967 Mattel, Inc./U.S. Patented/Other Patents Pending/Patented in Canada 1967/Taiwan. The first year doll wore a pretty pink satin dress, and the later doll wore a new peasant style dress with a slightly different hairstyle. In 1971 the hair ribbons were pink and in 1972 they were blue. The 1972 version is very difficult to find mint in box. 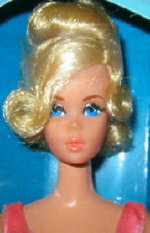 Changing hairdos is what this doll was all about. Her hair could go from short to long with a gentle pull. Add braids or a curly wiglet for a different style. A styling booklet came with both dolls to show how dozens of hairstyles could be created. 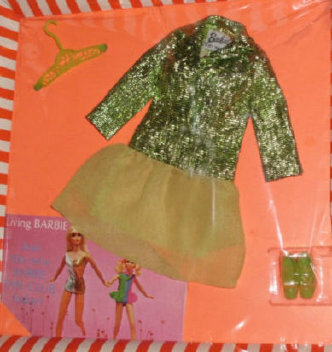 In the package along with the dressed doll were two hairpieces, styling booket and fashion accessories.